From Amazon: "We've long understood black holes to be the points at which the universe as we know it comes to an end. Often billions of times more massive than the Sun, they lurk in the inner sanctum of almost every galaxy of stars in the universe. They’re mysterious chasms so destructive and unforgiving that not even light can escape their deadly wrath. 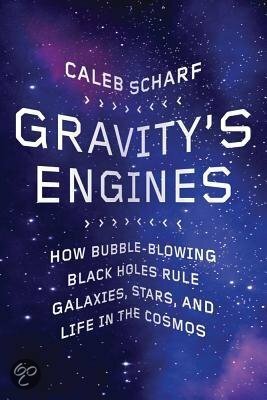 With clarity and keen intellect, Scharf masterfully explains how these bubbles profoundly rearrange the cosmos around them. Engaging with our deepest questions about the universe, he takes us on an intimate journey through the endlessly colorful place we call our galaxy and reminds us that the Milky Way sits in a special place in the cosmic zoo—a “sweet spot” of properties. Is it coincidental that we find ourselves here at this place and time? Could there be a deeper connection between the nature of black holes and their role in the universe and the phenomenon of life? We are, after all, made of the stuff of stars." Excellent writer also recently published 'Copernican Complex' which is on the topic of astrobiology.